On Sunday 29th October at 4pm at OLGC Catholic Church Forestville, Wyvern Music Forestville presents its final concert for 2017, continuing its “Rising Young Pianists” series by showcasing two young talents of the Australian keyboard scene, Nicholas Kennedy and Martin Lijauco. The concert will feature some of the greatest composers of keyboard music from Bach, Mozart, Brahms and Chopin to 20th Century Russia with Shostakovich and Kapustin’s classical and jazz fusion and 21st Century Australia with celebrated composer Carl Vine (AO). Born in Sydney in 1996, Nicholas Kennedy holds the Chapple-Bremner Scholarship at the Sydney Conservatorium of Music, where he is currently completing a Bachelor of Music (Performance) in the class of Clemens Leske. An inaugural member of the Conservatorium’s Rising Stars program, Nicholas made his concerto debut in 2014, performing Beethoven's Piano Concerto No. 1 with the Kuring-Gai Philharmonic Orchestra. He was a semi-finalist and prize-winner in the IX Lev Vlassenko Piano Competition, and received second prize equally on cello and piano at the 2016 Australian Concerto and Vocal Competition. He has performed in the Theme and Variations Emerging Artists Series, the Australian Festival of Chamber Music and the Australian Showcase of the XI Sydney International Piano Competition, and collaborated with the Australia Piano Quartet. In 2017, Nicholas won the Mary Greville and Bert Coughtrey Scholarship for overseas study, with which he hopes to pursue postgraduate studies in the UK or USA. Martin Lijauco is completing a Bachelor of Music (Performance) at the Sydney Conservatorium of Music with Clemens Leske, after which he plans to study overseas with a focus on accompaniment. 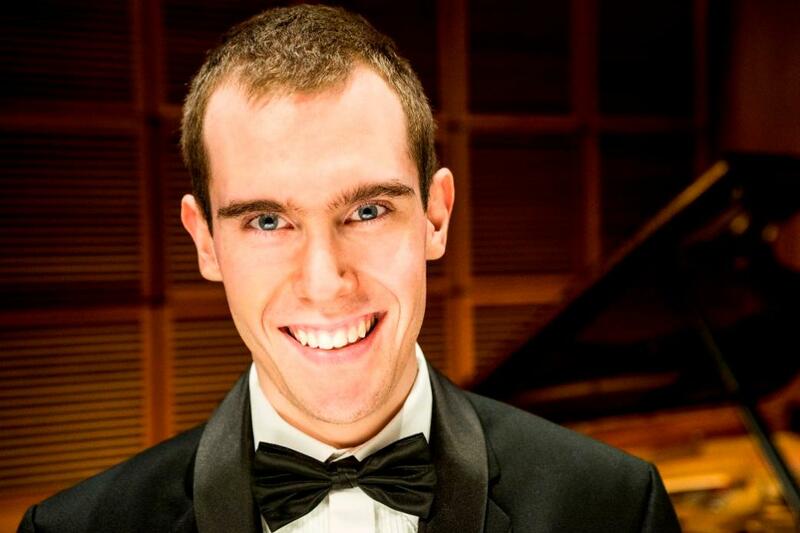 Born in 1994, he began piano at age six at the Sydney Conservatorium of Music’s ‘Open Academy’ program and continued studies at the Conservatorium High School, having quickly excelled with achievements in local Eisteddfod competitions and AMEB examinations. At the Con High, Martin extensively performed as a solo pianist and chamber musician, including performing in a broadcast of Mussorgsky’s Pictures at an Exhibition. Although his musical training has largely revolved around Classical repertoire, Martin also plays regular contemporary gigs which include a residency at The Grace Hotel in the Sydney CBD. He currently volunteers and serves as a Youth Music Coordinator at his local parish where he often co-ordinates the music for mass services, as well as performance sets for charity concerts which have helped his youth group to raise thousands of dollars towards ministerial services. Tickets at door: (including refreshments): $25 - full, $20- concession, $15– students, (children under 16 are free). Our Mission Statement is: "Sharing the enjoyment of live music and encouraging Australian talent." Wyvern Music Forestville is a not-for-profit organisation affiliated with the Federated Music Clubs of Australia NSW Council Inc.
Wyvern Music Club was first established in 1953 as Newington College Music Group, an offshoot of the Parents and Friends’ Association of Newington College at Stanmore. It was affiliated with The Federated Music Clubs of Australia which had formed in 1928. In January, 1976 Newington College Music Group changed its name to “Wyvern Music Club-Lindfield” and would hold four “musicales” a year at Newington Preparatory School, Lindfield and one annual concert at Willoughby Town Hall combined with four other Music Clubs (Lane Cove, Manly, Mosman and Roseville). The Wyvern name came from the wyvern symbol in the Newington School logo. In 2004, the decision was taken to relocate the concerts to Forestville to meet the needs of a new generation of classical music-lovers in that area. Wyvern Music Club became known as Wyvern Music Forestville. The concerts were held at Forestville Uniting Church until 2010 and from 2011 at Our Lady of Good Counsel Catholic Church Forestville. In July 2010 Wyvern Music launched its fundraising effort to purchase a grand piano with the Reg Marsh Memorial Piano Fund Piano Gala concert performed by pianists Simon Tedeschi and Stephen Whale, with violinist Marina Marsden. This was followed by a Buy-a-Key donation incentive through the FMCA PATIM Fund and a fundraising piano recital by Gerard Willems AM in 2011. In early 2013 a Yamaha C3 piano was successfully purchased through Theme & Variations Piano Services and given its inaugural performance for WMF at OLGC Catholic Church by Philip Shovk. Over the 64 years since the Club’s foundation, Wyvern has featured many well-known Australian musicians. In the early years these included the composer-pianists Frank Hutchens OBE, Lindley Evans, Larry Sitsky AO, Miriam Hyde AO OBE and Dulcie Holland AM, operatic soprano Marilyn Richardson, violinists Errol Collins, Errol Russel and Mary Nemet, and pianists Isador Goodman AM, Dorothy White, Erika Booker, Werner Baer, Beryl Potter and Sonya Hanke. Many young talented instrumentalists were given performance opportunities at Wyvern, including violinists Natalie Chee, Richard Tognetti AO, Asmira Woodward-Page and Nicholas Milton AM and pianists Duncan Gifford, Michael Kieran Harvey, Tamara Cislowski, Grace Kim and Philip Shovk. Prominent former and current members of the Sydney Symphony Orchestra such as violinists Goetz Richter, Kirsten Williams and Marina Marsden, clarinettist Anne Menzies, bassoonist John Cran, oboist Shefali Pryor, violist Justine Marsden, flautist Janet Webb and trumpeter Paul Goodchild as well as eminent Sydney Conservatorium (University of Sydney) lecturers such as pianists Gerard Willems AM, Daniel Herscovitch, David Miller AM, Dr Jeanell Carrigan and Clemens Leske, cellist Georg Pedersen and clarinettist Mark Walton have also performed over the years for Wyvern. During the Wyvern-Lindfield era, students from the Sydney Conservatorium under the direction of David Miller AM performed regularly. Wyvern Music Forestville has continued the support of emerging artists with an annual performance by the Sydney Symphony Orchestra Fellows under the Artistic Leadership of Roger Benedict.